The Rebel Sweetheart. 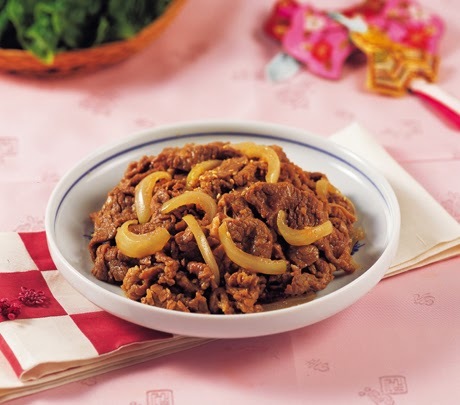 : Foodie Goodie | Bulgogi. Just four more days 'til Christmas and here I am trying to figure out what to cook for our traditional Christmas Eve Feast aka Noche Buena. My London-based cousins are coming home for the holidays (this will be their first Christmas in the Phi since they left for London ten years ago), and they're all asking for lechon. So yeah, roasted suckling pig will definitely be on the menu as requested. We usually have two or three meat dishes on our Noche Buena table so I'm thinking of bulgogi as the other meat entree for the night. 1. Rinse beef thoroughly under running water. Dry excess water then remove excess fat and cut into thin slices. 2. In a bowl, mix all the ingredients for the the marinade. 3. Add the beef and onions to the marinade. Mix well, and marinate it for 30 minutes. 4. Heat the griddle or pan and grill/fry the beef on high heat. You got me at Bulgogi lol, can't believe it's this simple to make! Ooohh, pear juice pala! That's why I can't seem to make it taste as close to the resto dish! :) Will this Czjai, thanks for sharing! This looks good. I hope you figure out what to make. I'm responsible for figuring out what to have for new years. What a great dish! I'll have to try it! Looks so delicious! Seems to be easy to make as well. Love the recipe, but I don't like beef meat. Will have to try this with mutton. Thanks for sharing. This looks good. I have a delicious dinner planned for Christmas. I am a turkey lover. I am so picky that I wouldn't eat it. Maybe if I left out onion.